This extension facilitates slicing a drawing into rectangular bitmaps for use in Web pages. It will optionally export CSS and HTML code for use with the bitmaps. There are two steps in using this extension. First, the Create a slicer rectangle dialog is used to define a set of named rectangles for the areas that are to be exported. Each rectangle can specify a different target format (PNG, JPEG, or GIF) and optionally, a background color. The rectangles are stored in a separate Layer named Web Slicer. After defining the rectangles, the rectangle regions are exported using the Export layout pieces and HTML+CSS code dialog. A third dialog can be used to add attributes in the HTML. The dialog consists of a number of entry boxes for specifying export rectangles. Note that the placement of the rectangle is not defined in this dialog. After clicking the Apply button, a partially opaque rectangle will be created. You move and resize this rectangle to cover the area that should be exported. Name: Give a name to the export rectangle. The dialog can be used repeatedly with different names to define multiple export regions. Format: Specify the bitmap format. Different regions can have different formats. Force dimension: Specify the exact size of the bitmap (in pixels). If specified, the DPI setting is overridden. Background color: Background color for region. This will not be displayed by Inkscape. Three tabs allow additional parameters to be specified. 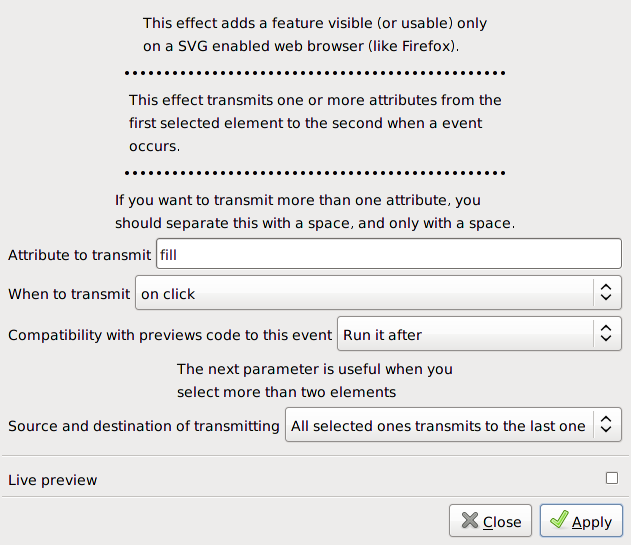 Note that the HTML tab specifies attributes that apply to the export rectangle. This dialog allows you to specify where the output files should be stored and if HTML and CSS code should be produced. Note that the HTML and CSS code is not intended to be the final product but instead allows you to quickly check the output and to generate code that can be pasted into other files. Clicking the Apply button does the actual export. 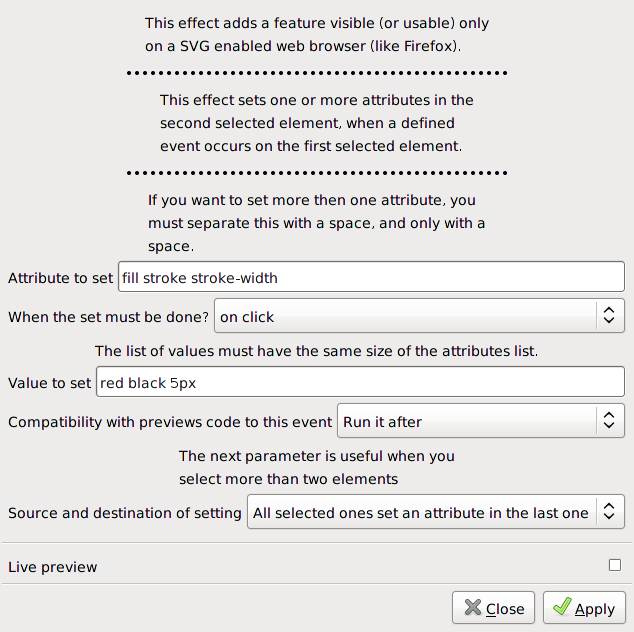 This dialog allows you to set attributes that apply to the HTML and CSS that apply to the group of bitmaps exported. At least one of the Slicer rectangles must be selected in order to set these attributes. All of the attributes applied to the rectangles and HTML export are stored in <svg:desc> tags. These tags are not easy to edit via the XML Editor dialog. It may be easier to edit the SVG file in a text editor.